In this season perhaps more than any other, Tottenham versus Everton presents a real clash of styles. André Villas-Boas is one of the poster boys for modern continental tactics, typically favouring a high line, full-pitch pressing, fluid positioning and the maximisation of technical talent in open play. David Moyes is an old school Brit who likes his teams to remain deep and compact, physically dominating and primarily effective from direct passes and set pieces. Of course, neither manager adheres quite so rigidly to their stereotype: both have succeeded this season due to their ability to adapt their ideas and reshape their teams on a regular basis. Consequently, whenever the two face each other it is hard to know what to expect, although the quality is always likely to be high. Both managers are avid analysts and will have watched enough tapes of each other’s sides to know them like the back of their hand, but it seems that they are still feeling each other out come match day. In 2011-12, when AVB was managing Chelsea, the two shared the Premier League spoils with a win apiece. 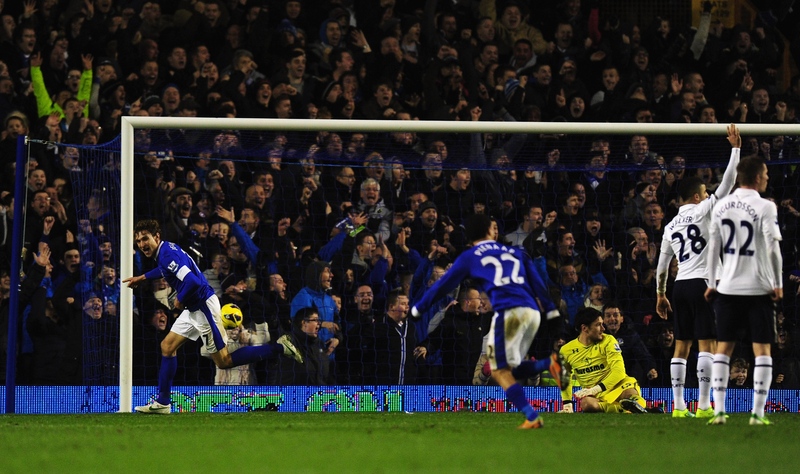 A further meeting in the League Cup fourth round saw Chelsea triumph in an extra-time thriller at Goodison Park, while Spurs’ visit to Merseyside in December 2012 saw an infamous stoppage time collapse hand the points to Everton when it seemed certain that Tottenham had them in the bag. Sunday’s fixture will be another wildcard, particularly as both sides will be without key players. As Tottenham have lost their main attacking weapon in Gareth Bale, Everton go into the game missing the totemic Marouane Fellaini and Steven Pienaar, a player whose intelligence and positioning has been key in getting the best out of marauding left-back and wannabe-Britpop-guitarist Leighton Baines. Indeed, the positional interplay between Baines and Pienaar has arguably been the key feature of Everton’s play this season; 43% of the Toffees’ attacks have been from the left. In much the same way that a second striker uses his more static partner as a fulcrum, Baines has used Pienaar as a conduit for his creativity and the partnership has suited both players. They don’t really do anything special, but effective simplicity has always been a calling card of Moyes’. Pienaar’s languid guile and grace draws defenders in and allows Baines space and time to overlap, with or without the ball, and supply one of his renowned, accurate deliveries. The opposite flank has historically been the home of the heroically adequate Tony Hibbert, a man whose career proves that mastering the art of smiling and nodding really can take you to the top of any profession. This season, however, Hibbert has been replaced by the rather more penetrative Séamus Coleman, who has played with Kevin Mirallas ahead of him. Last season at White Hart Lane, Moyes fielded Coleman as a defensive winger with Phil Neville in the full-back berth and doubled up on Bale, but with the Welshman absent this time around (sorry for reminding you) there will be no need to reprise that particular gameplan. With Coleman and Mirallas in good form and Tottenham’s left side somewhat shaky of late, the only thing stopping Everton from continuing with this partnership is a troublesome knock carried by the Belgian. Darron Gibson will probably partner Phil Neville in the second midfield band and they will, one surmises, be more than content to let Tottenham have the ball for the majority of the game. Both are competent passers of the ball but with Moyes likely to embody his stereotype as a timid and fearful reactionary, his midfield will simply sit in front of the defence and try to make Spurs play the ball wide rather than forward. To that end, England international Leon Osman will probably move left and take up where Pienaar left off. Up front, Moyes usually picks a typical number nine and instructs a more positionally astute midfielder to work off of him. This approach has done wonders for the careers of Tim Cahill, Pienaar and Fellaini, whose goal tallies have benefitted from his interpretation of their role, but on important occasions such as Sunday, Moyes has been known to paradoxically prefer two out-and-out strikers. With Fellaini unavailable, he may well select Victor Anichebe to partner Nikica Jelavić. Whatever the personnel, Everton’s approach will be that of the typical reactive English side. They will position their defence twenty yards out, the midfield ten yards further forward and play on the break with their full-backs moving forward when transition opportunities present themselves. Mirallas and Osman will hold onto the ball for longer than their colleagues, and they, along with the front two, will look to win free-kicks whenever possible. The amount of time the ball is in play could decide everything. The longer the ball spends dead, the better Everton’s chances will be of containing Tottenham. The more open and free-flowing the game is, the more likely it is that Everton will be broken down. Therefore, AVB should play with a similar system to the one that worked so well in the first half against Swansea. While Everton will be ready to sit deep and absorb pressure, they will probably be undone – or at least exposed defensively – if forced to take the initiative and keep the ball. Gylfi Sigurðsson did well against Ángel Rangel last week and the task of nullifying the similarly-minded Coleman will not faze him. On the other side, it may be sensible to take a leaf out of Moyes’ book and double-mark Baines, given that such a majority of Everton’s attacks come through him. With Aaron Lennon injured it may be that Kyle Naughton, the last natural defensively minded wide player standing, may have to play regardless. Before Spurs set up to draw Everton out, they should take the precautionary measure of telling Scott Parker that the idea is to let the Toffees have the ball for long periods; the last thing Spurs need is him charging in to tackles and giving Baines the chance to deliver a dead ball from thirty yards out. In an attacking sense, the problem of replacing Gareth Bale is not one that can be easily solved, but as Lisa Simpson once pointed out, the Chinese have the same word for ‘crisis’ as they do for ‘opportunity’. A vacancy in the middle of the park is just the tonic that Clint Dempsey has been looking for and his record in important games stands him in good stead for this six-pointer. Emmanuel Adebayor probably won’t get much change from Phil Jagielka and Sylvain Distin, but his movement for both goals at the Liberty Stadium was excellent, and proved that he can be trusted to drag his markers out to create opportunities for others. In this case, Dempsey and Sigurðsson should be looking to profit. In summary; David Moyes and Everton know how not to lose, and if a draw is on the table from the get go they will take it. Tempt them with the possibility of two extra points, however, and they can be conquered.